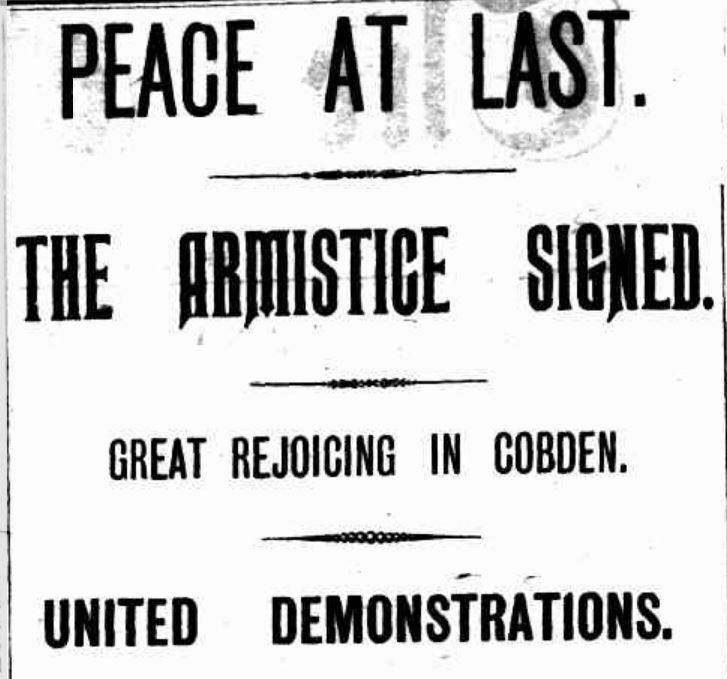 Today is the centenary of the signing of the Armistice which brought an end to the fighting of WW1. 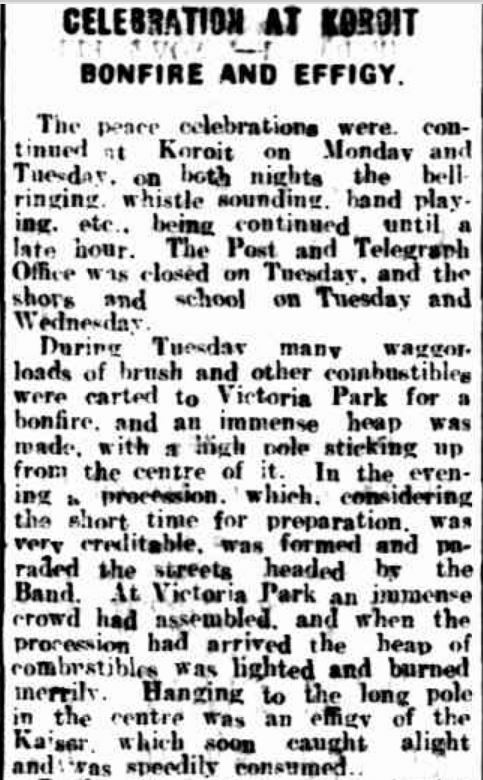 News arrived in the Western District between 8.30pm and 9.30pm on Monday 11 November 1918 while for other towns, it was the following morning. Everyone knew it was coming, the question was when. 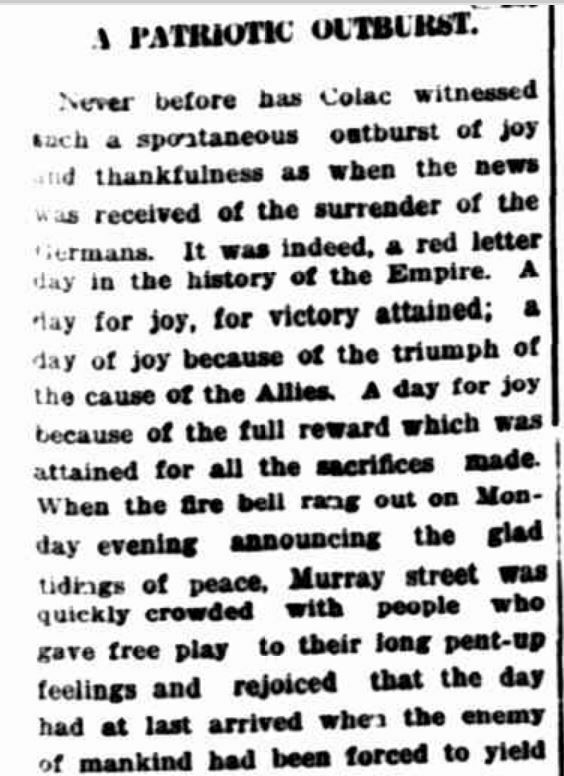 Hopes were high after the surrender of Austria and Turkey but there was still uncertainty and an unwillingness to celebrate until the official word came through. 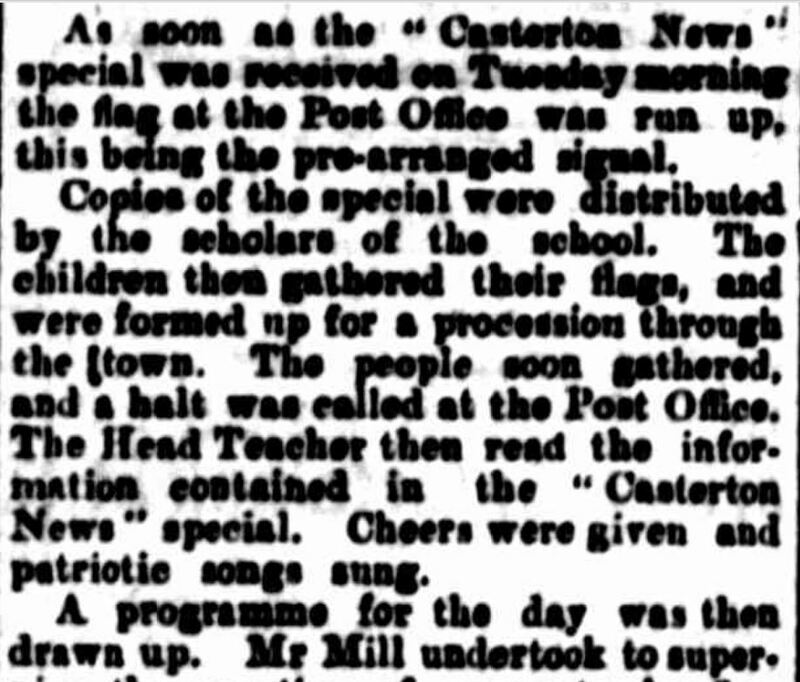 Most towns had put in some preparation organising bands and ensuring bunting was at hand ready to decorate the streets. 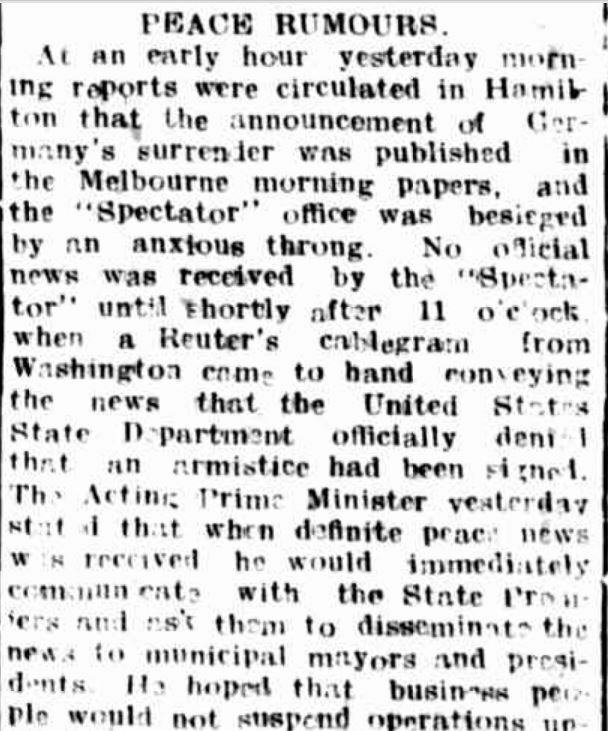 Early on 8 November, rumours spread around Hamilton, Coleraine and other Western District towns that the signing had taken place. But they were just rumours. Let’s do a fly around the Western District and see how each town reacted. In most cases, the reaction was like nothing seen before. 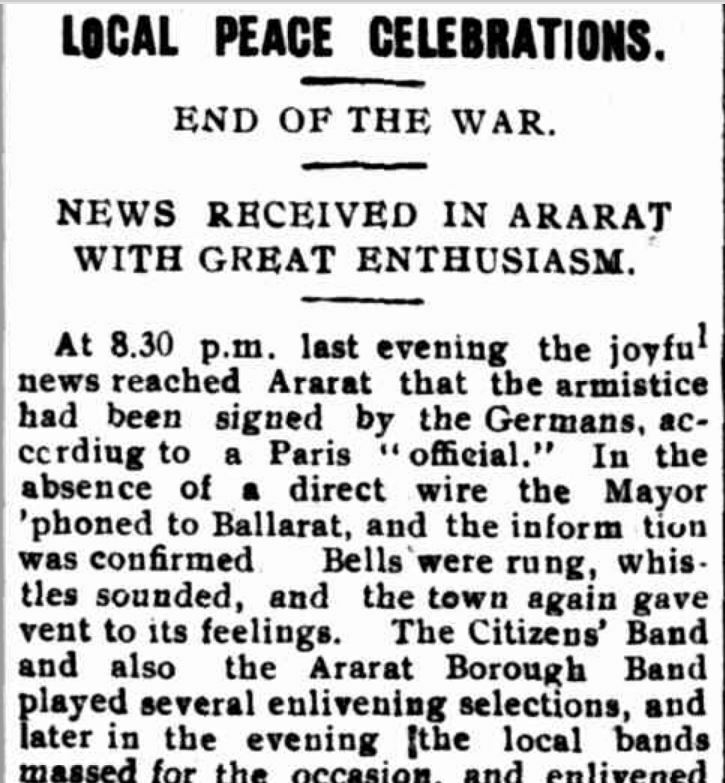 In Ararat, official news came through at 8.30pm on 11 November. Bells started to ring and the two local brass bands swung into action. 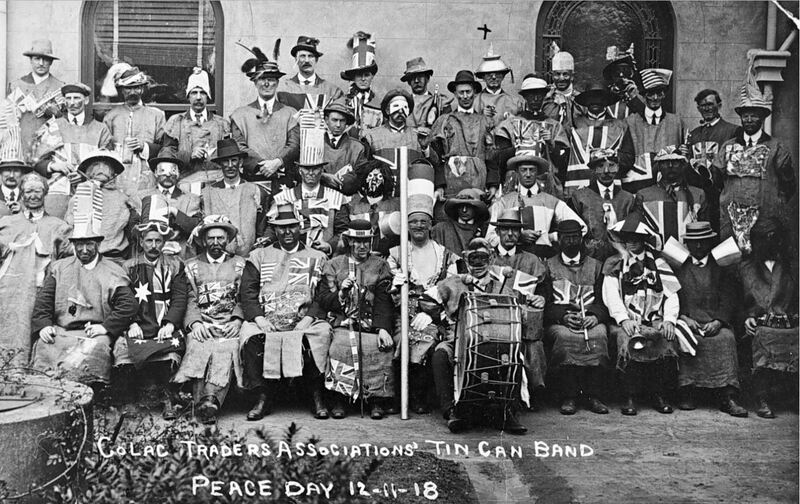 Celebrations continued on into the morning of Tuesday 12 November. 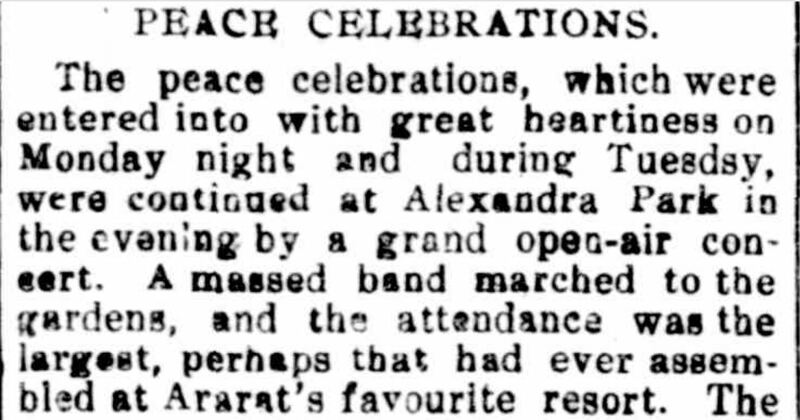 Then into Tuesday evening with an open-air concert at Alexandra Park. 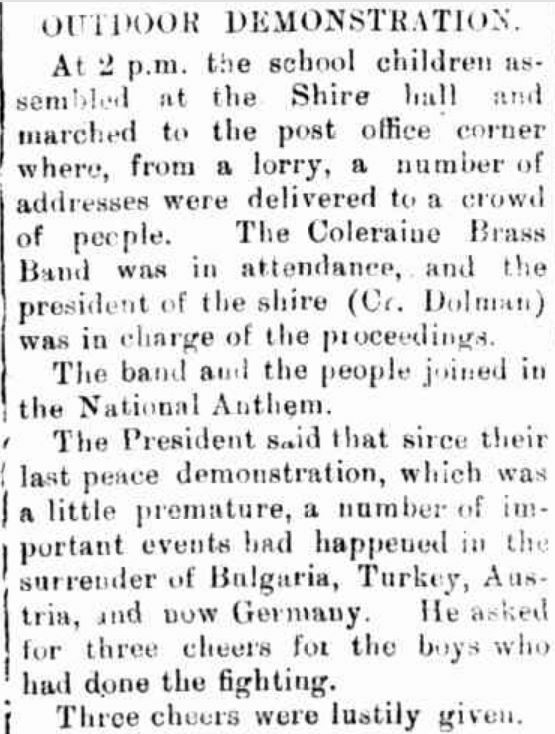 In Penshurst, church bells rang and the Penshurst Brass Band played. 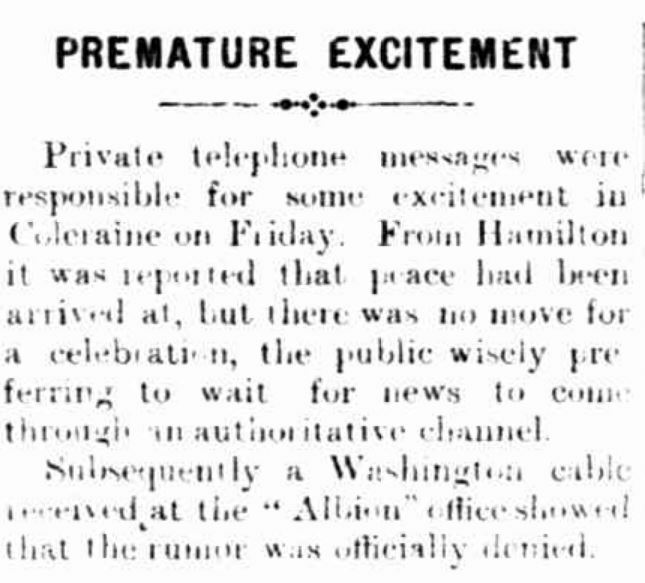 Just before 9pm, the Hamilton Spectator received a cable and immediately told those waiting in front of the offices in Gray Street. 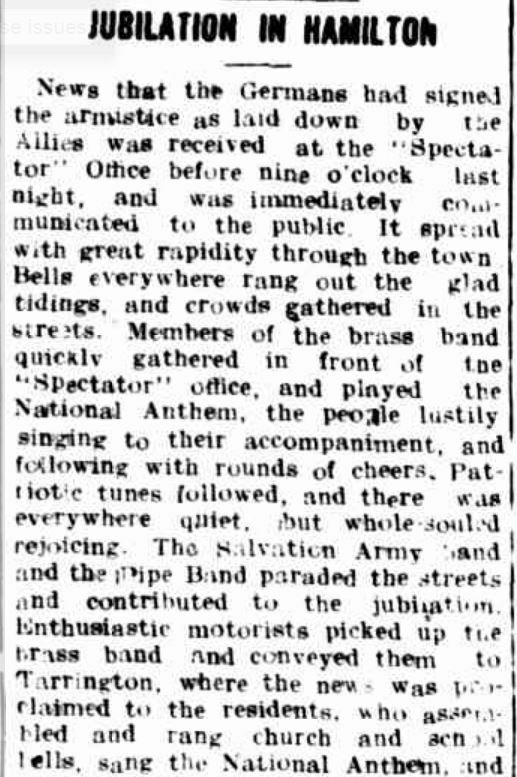 Bells rang, the bands played and people flooded into the streets. 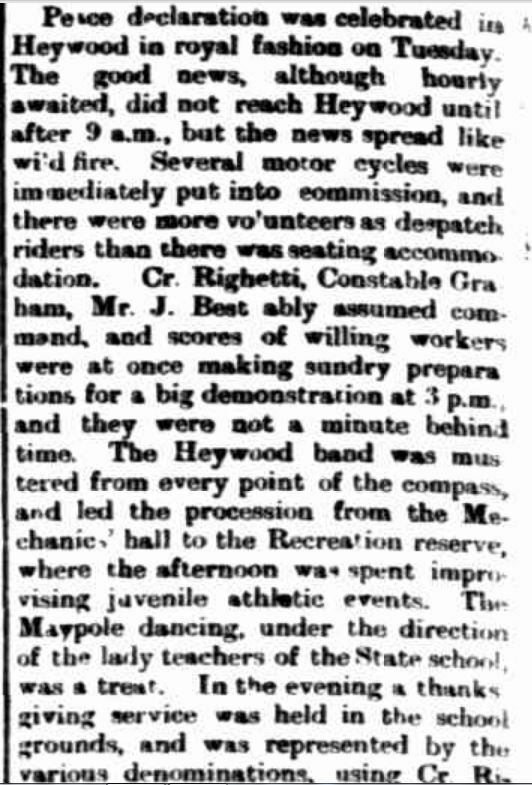 The Hamilton Brass Band was taken by motor car to Tarrington to tell residents there. After a false start to celebrations, Coleraine took no time took to get in the spirit. On 12 November the children marched along the streets of the town. 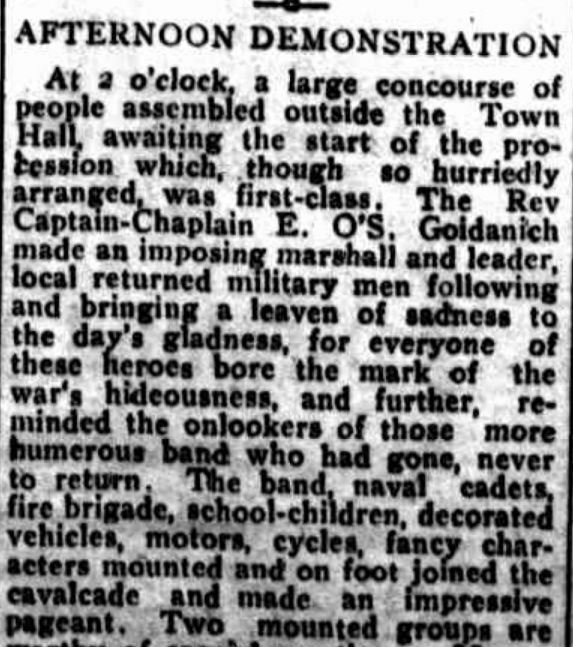 At Casterton, the townsfolk were “delirious with joy”. 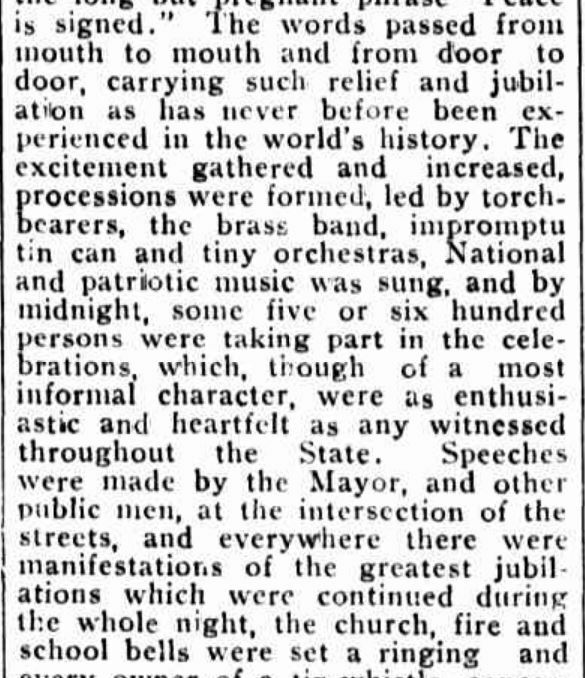 There was fireworks, bands and dancing. 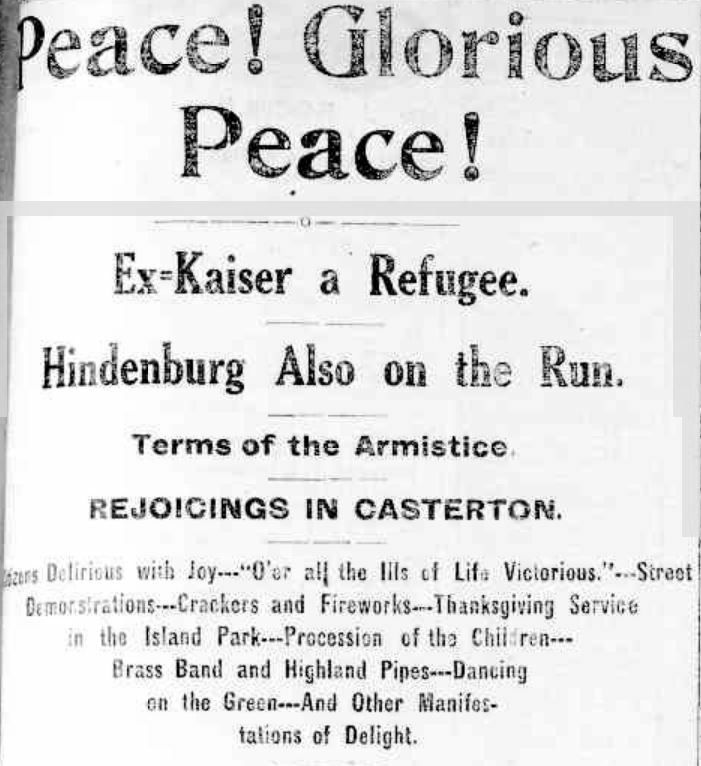 Tuesday 12 November was a holiday in Casterton as it was in most places. Some towns like Sandford and Merino waited until official word was received the following morning. At Sandford, in a prearranged manoeuvre, the sight of the flag going up the pole of the Post Office signalled the end of the war. 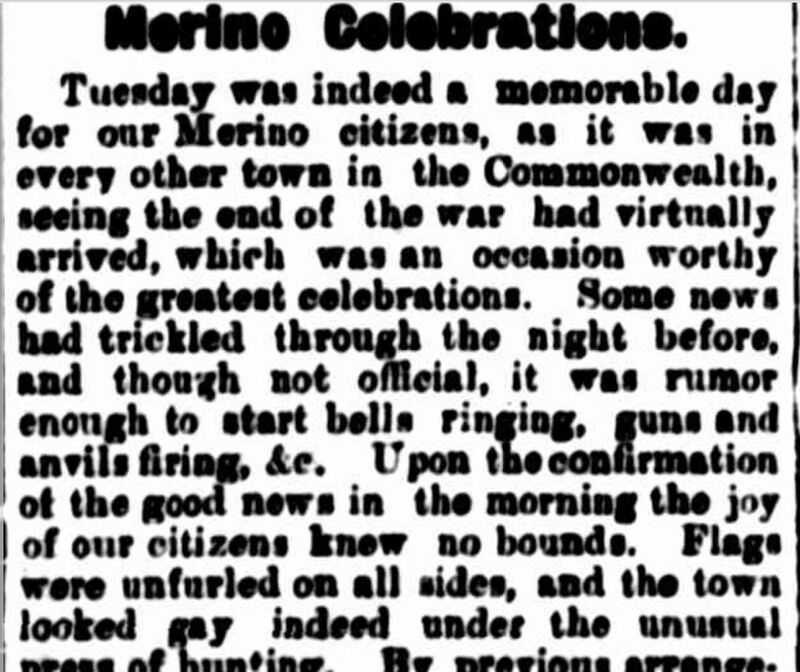 At Merino, bells rang and guns fired. 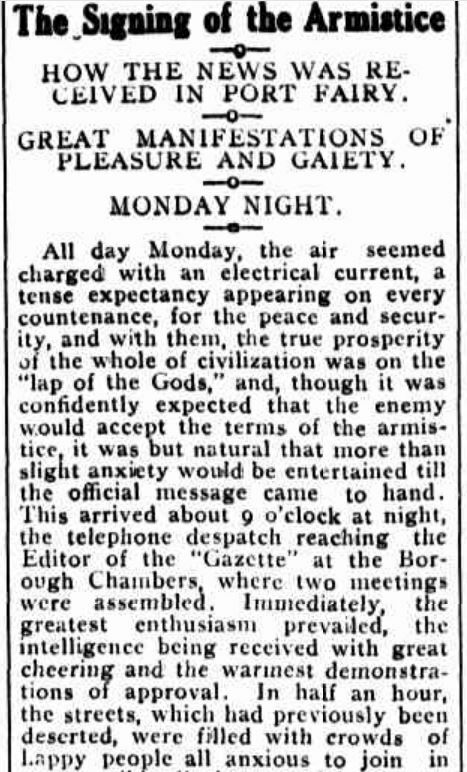 At Portland, the Observer received an urgent wire from Reuters around 9.30pm on 11 November with the news and the celebrations began. 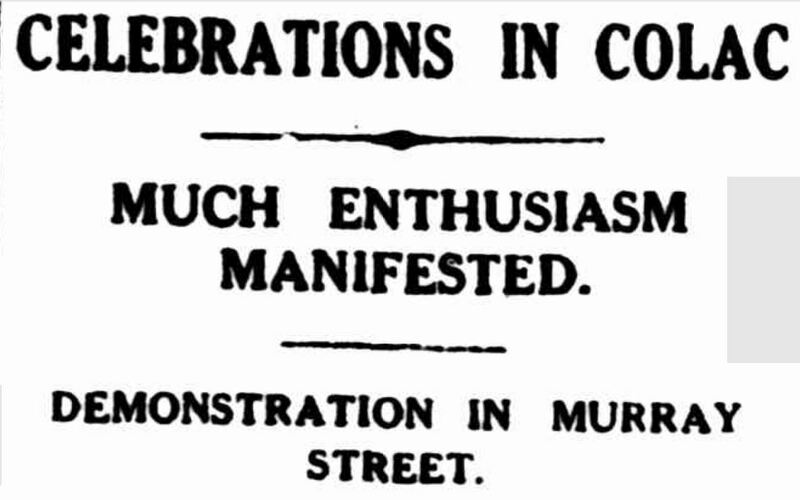 People got out of the beds and rushed into the streets. 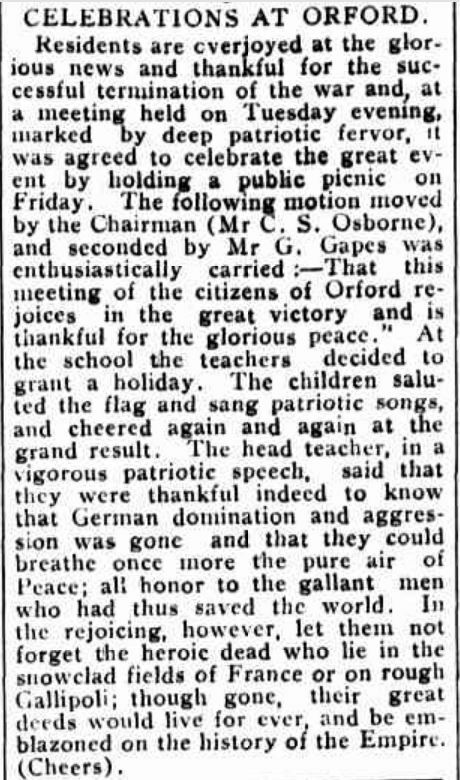 At Orford, a public picnic was planned for the following Friday. At Port Fairy, there were a couple of hiccups but that did suppress the euphoria. 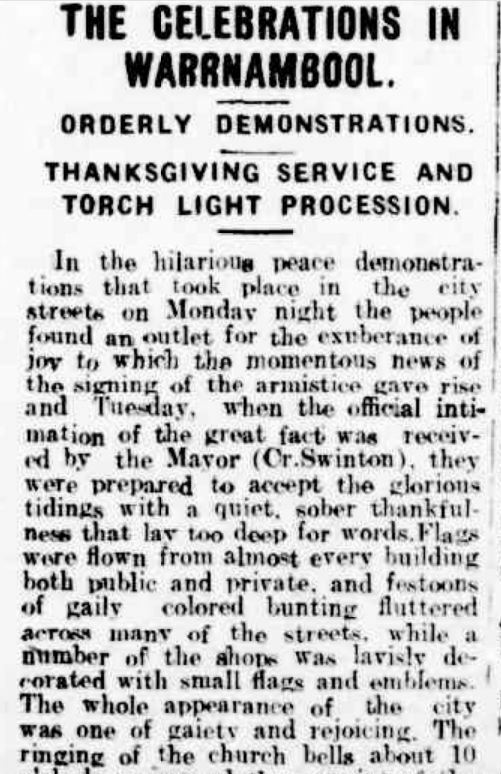 The official message arrived about 9pm on 11 November and the news spread around the town like wildfire. Tuesday was a holiday and just as well because no one would have turned up for work anyway. 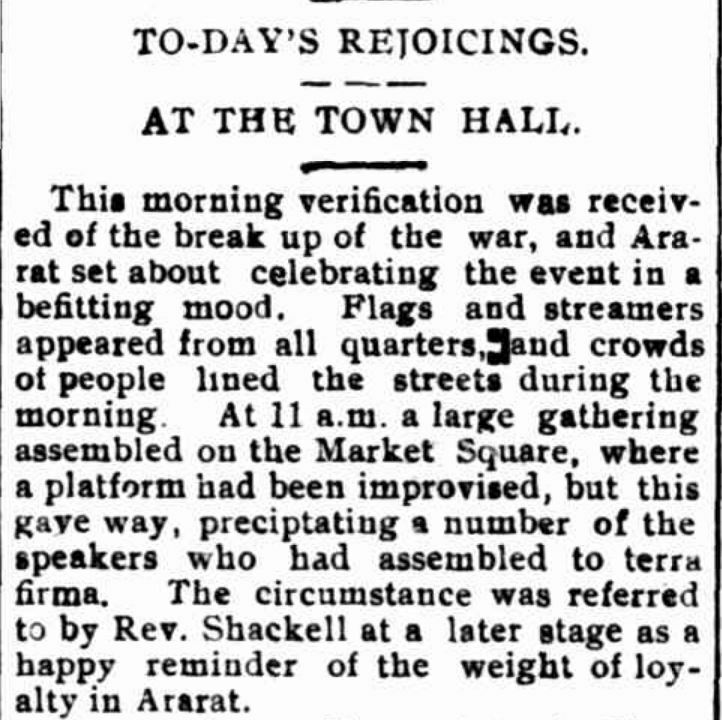 Port Fairy’s celebrations continued all Tuesday and into Wednesday. At Koroit the shops and school closed Tuesday and Wednesday. A large bonfire was built and on Tuesday night after a parade, it was lit. 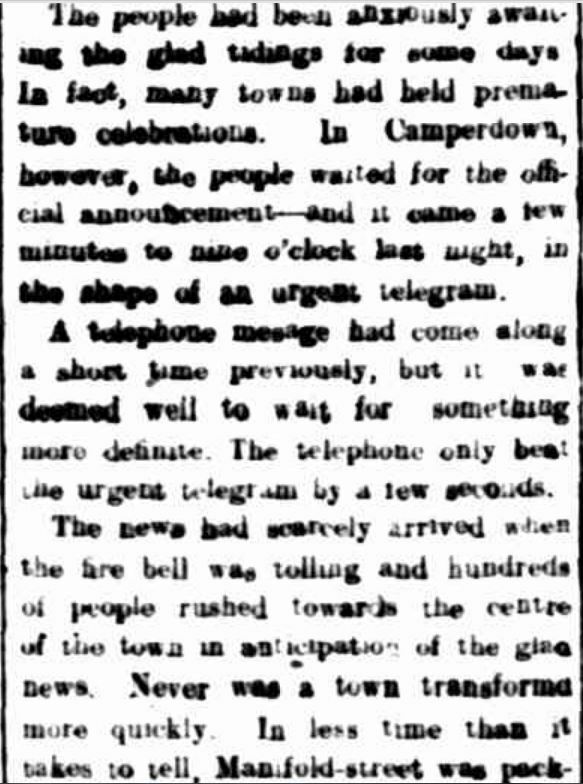 In Warrnambool, people waited outside the Standard office for the news on the evening of 11 November. Fire bells started ringing as soon as the news was read out. 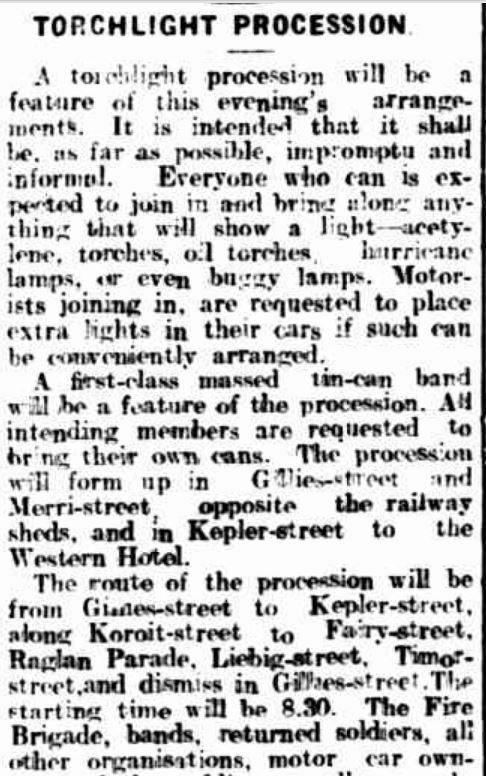 A torchlight parade was organised for Tuesday night with a massed tin-can band. 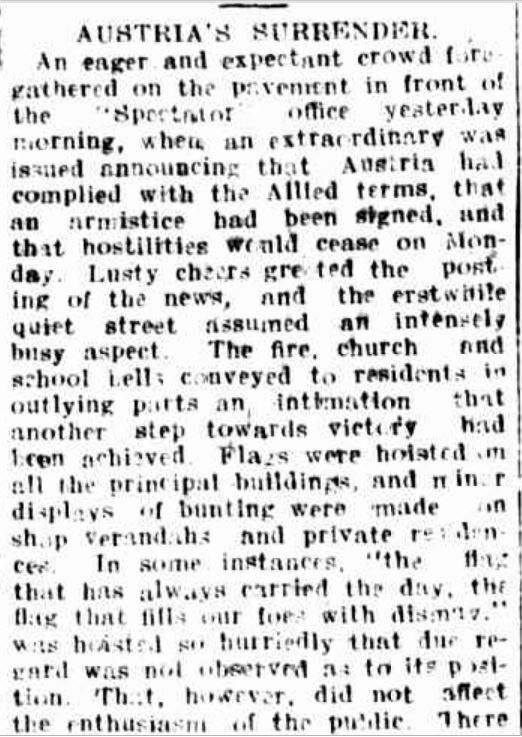 Buildings and streets across Warrnambool were decorated with flags and bunting. Camperdown residents rushed into Manifold Street. 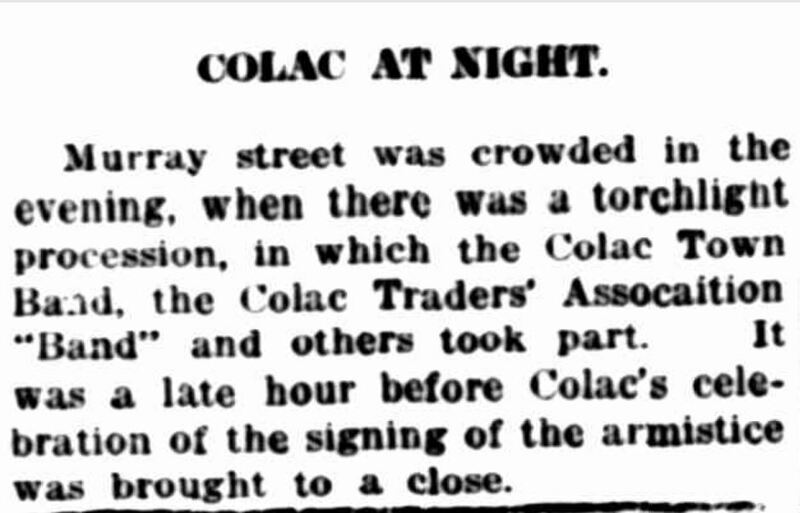 In Colac, they went “wild”. A torchlight parade took place on Tuesday night. 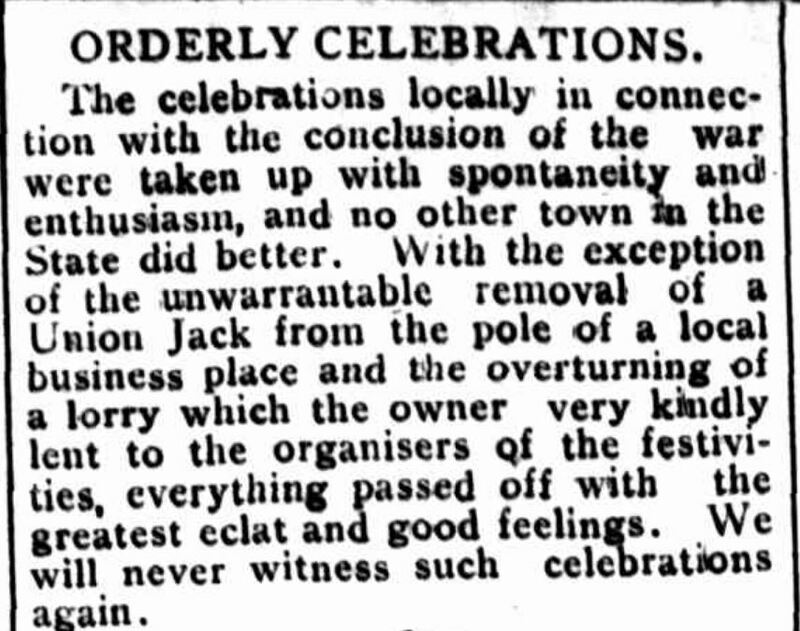 .Despite all the celebrations, the underlying feeling was summed up by the Warrnambool Standard. Christmas in the 1930s was tough as the Depression set in but the goodwill shown by those more fortunate helped make the day a little happier for those who had nothing. Fewer advertisements for Christmas gifts was obvious but by the middle of the decade there was something new to advertise, electrical products. By the end of the decade, Australians realised that the war to end all wars, the Great War, was not the end. The big message to shoppers throughout the 1930s, a follow on from the 1920s, was to “Buy Australian”. At least they still had the choice then. The Victorian Dried Fruits Board came up with this recipe and more were in their free cook book. 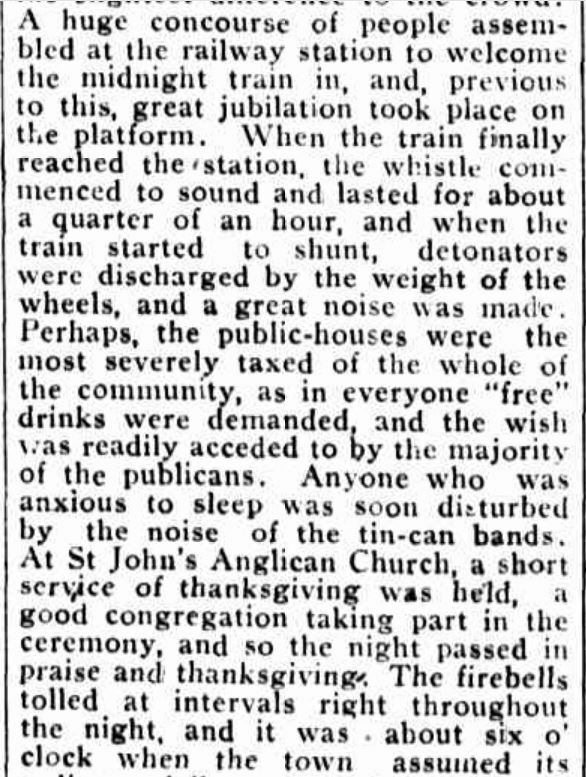 What a nice touch from the Portland Guardian editor for Christmas 1930 as he reminds us not to forget “our brothers the animals” at Christmas. Now what’s for dinner? The State Relief Committee were calling on all housewives of Victorian to contribute to the making of 10,000 Christmas puddings for Christmas 1931. Others providing aid to feed the unemployed and their dependents were merchants, farmers and manufacturers. A “Mother Hubbard Cupboard” was placed in Horsham’s Firebrace Street in the week leading up to Christmas Day 1931. Non-perishable goods could be put on the shelves, but on December 24, poultry and other perishables could be added. 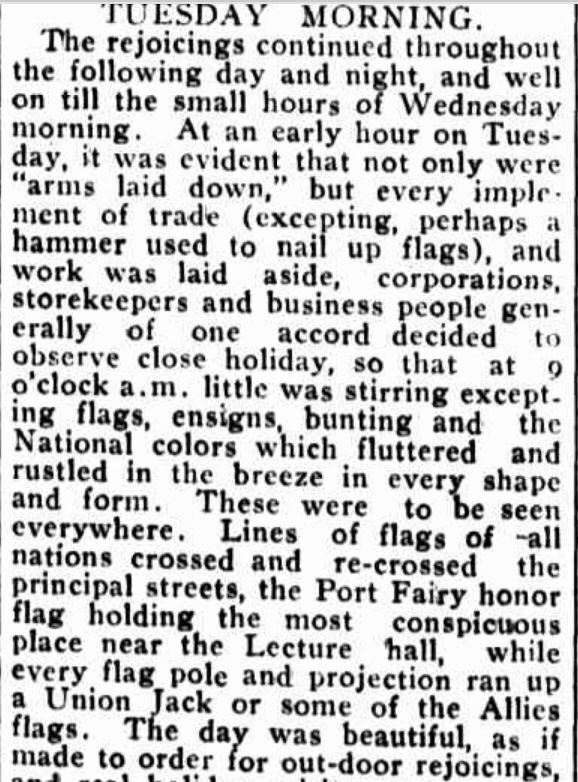 Horsham shops were adorned with cyprus greenery and bunting for Christmas 1931. Good weather gave shoppers a feeling of bright times ahead. Guesstimates in 1932 put the annual Christmas shop at over £1,000,000. 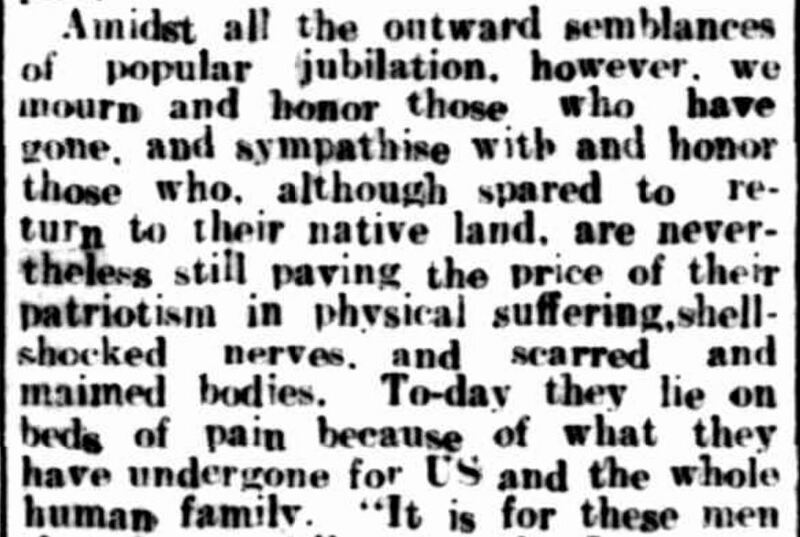 The Portland Guardian considered the effect this would have on Australia’s prospects if all that money was spent on Australian made goods. Another guesstimate suggested this would generate £250,000 of wages and thus stimulate the economy. A trip to the pictures over the Christmas period became more popular during the 1930s. 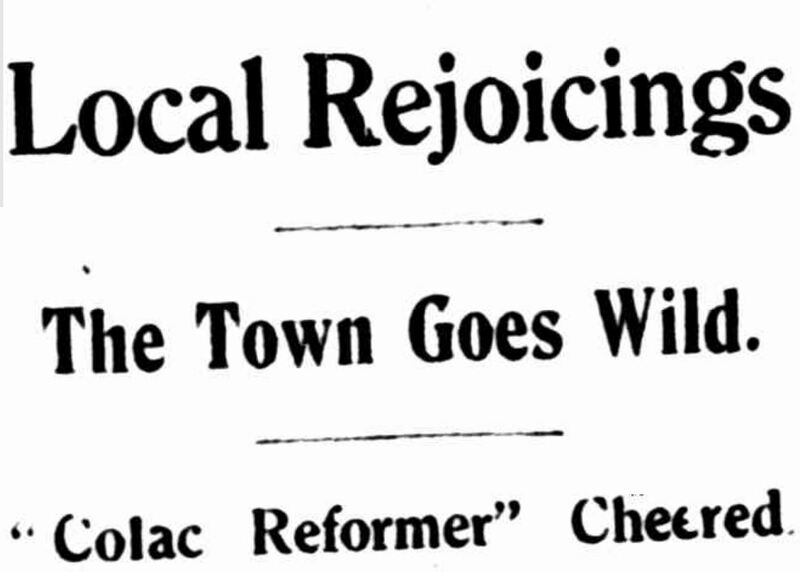 Hopes were up for some old-time Christmas spirit for 1933. Money was beginning to circulate more than it had in the two years before. The banks received £30,000 of coins from the Treasury for Christmas 1933, for the purpose of change, while in 1932, the amount required was only £10,000. Buying for the man of the house is not an easy task any Christmas. In 1933, wives were advised to “Please Him, Not Only Yourself”. Obviously written by a male and one with considerable tastes too. It was suggested that a subscription to a magazine such as “National Geographic” would be appealing to a husband, but stay away from the “Vogue” and “Harper’s Bazaar“. Campbell’s Cash Store also had gift suggestions for men including Fuji Tennis shirts and boxed suspenders. Another call for “Buy Australian” and possibly a more accurate guesstimate from the Commonwealth statistician regarding the annual Christmas spend. The trend of dieting was taking off in 1934, but girls, forget it at Christmas. Buy Australian first, Empire goods second. Hams were scarce in 1935 after 1000 overcooked in a factory fire at Dandenong. Camperdown’s famous clock tower was lit up for Christmas 1935. 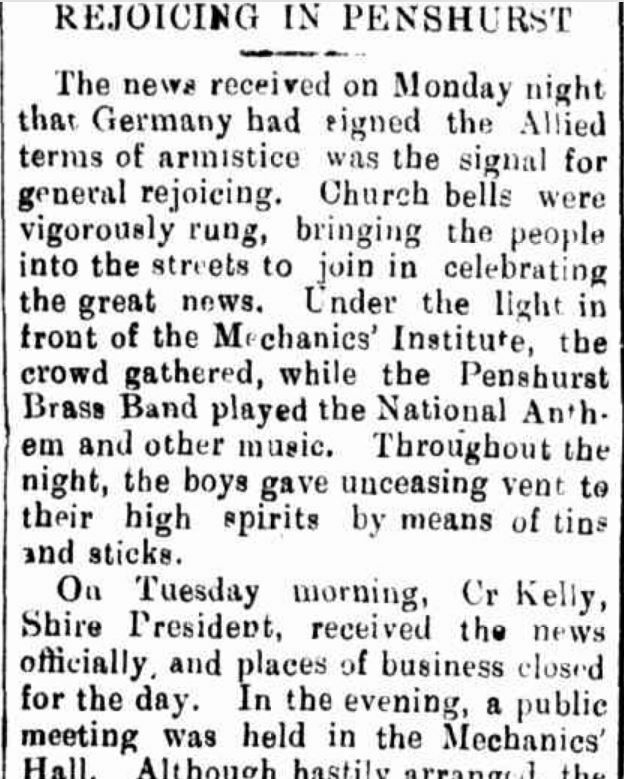 Christmas Eve plans in the town included the arrival of Santa at 7pm and amplified music broadcast from the Amalgamated Wireless Australia Ltd. At 10pm, dance music would be played in Manifold Street. In 1935 at Cobden, Santa arrived at a golf course in a car to meet with children from the Cobden School. Times sure were changing. The well known Hedditch family of Bridgewater ate Christmas dinner at the same table the family had celebrated around for the previous 90 years. Those at the table in 1935 included the fifth generation of Hedditchs to do so. Electrical appliances boosted advertising during Christmas 1936. This article comes from a double page feature in the Argus of December 4, promoting various brands of electrical products including Hecla kettles. There was also a message from the State Electrical Commission, remember them, recommending electrical products as a Christmas gift. Even the geese were thinking about the merits of dieting in 1936! Greeting telegrams returned that year. The giving of plants at Christmas was beginning to take off in 1937 and J.W. Robinson from the Ormond Plant Farm had some suggestions. Prosperity was beginning to return to Australia and 1937 was one of the best seen for many years. There had been a recent decline in wool and wheat prices but things were still looking promising. As Australian manufacturing grew, more Australian goods were being consumed than ever before. 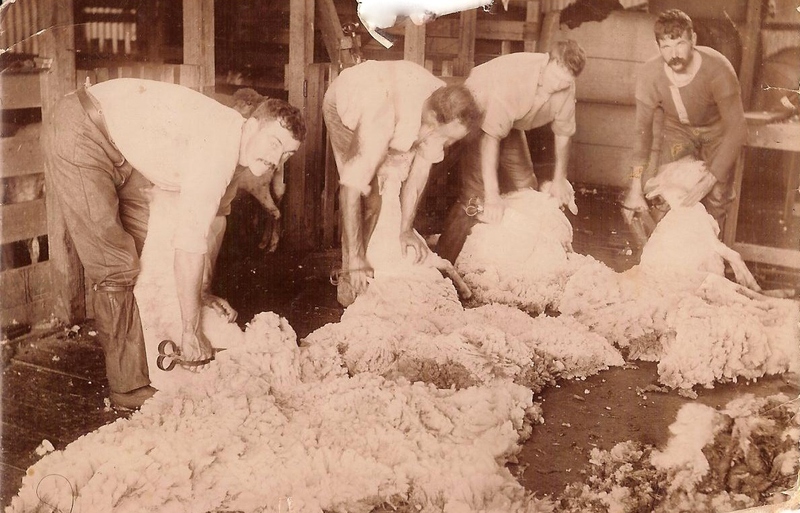 Apparently in the past Australians were ashamed to give an Australian made Christmas gifts, but with a growing pride in the quality of product being produced, that was changing. 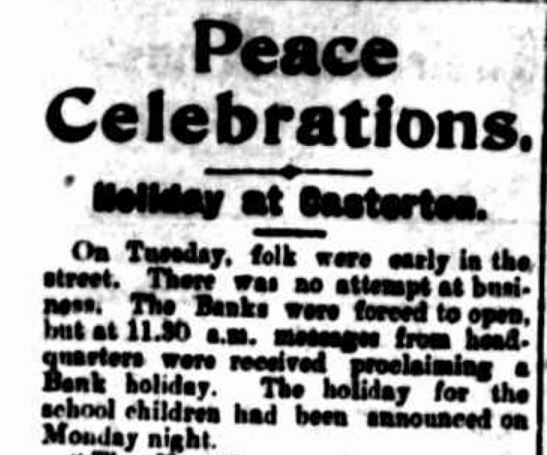 The Government were offering some Christmas cheer in 1938. The Horsham Times considered the history of Christmas. Someone or something stole Mr L. Harvey’s turkey the week before Christmas, 1938. Christmas 1939 arrived and so had WW2. 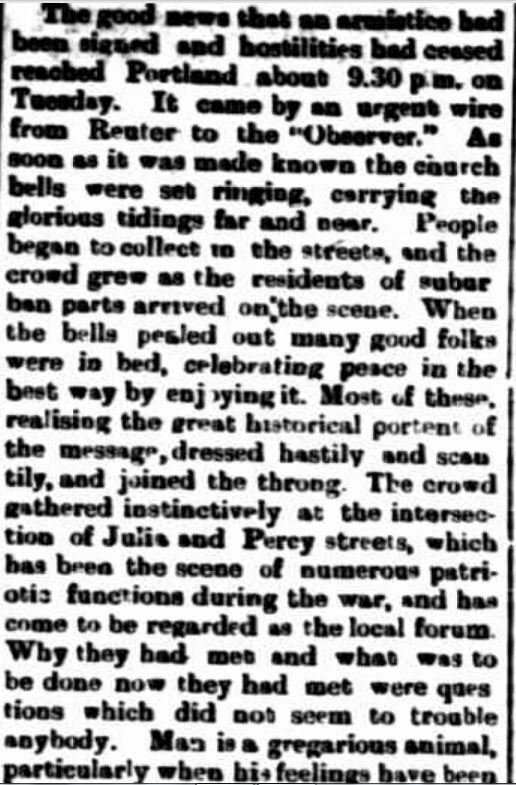 It was the first of six Christmases Australians would celebrate while troops were fighting. An interesting scheme in Victoria was given the go ahead to continue despite the war. Gifts of Victorian produce could be bought from the Department of Agriculture which would then be sent overseas to British recipients. Produce included tinned fruit and sultanas. If you couldn’t afford a Christmas ham in 1939, you could always try to catch one at the Horsham Christmas Angling Competition. Fifty children from the Narrawong district enjoyed a visit from Santa and gifts from a Christmas Tree. Just like WW1, the soldiers’ Christmas hampers were a focus, something that would continue into the 1940s.